SEO For Blogs - It's Easier Than You Think! What’s in a name? In the case of SEO-friendly blogs, everything. What you name your blog post is imperative to its success, and by success I mean everything from social shares to clicks, likes, and all other metrics of value in today’s internet-centric world. If you simply want to write a blog that gets popular quickly, utilize tools like Google trends, then cross reference those trending topics through Google Adwords to identify the related phrase with the highest search volume. For example, you find that giraffes are trending. Throw the word “giraffes” into Adwords and weed through the keyword suggestions until you come across a high search volume query phrase. You’ll likely find something like “facts about giraffes”, which can become your “target keyword” and you can work from there with a catchy title like “4 Unbelievable Facts About Giraffes”. Easy. Remember when we were discussing Adwords keyword suggestions and I mentioned that it’s smart to set a few related keywords aside? This is where they come in handy! It’s 2015, and the spammy, antiquated practice of keyword stuffing (saturating copy with keywords in unnatural ways), is SO 2010. Instead, utilize your target keyword (we’ll stick with colon exam), and any high search volume variations that you found in your research. Now that you’ve crafted a keyword-focused title, you don’t have to worry as much about incorporating them excessively in the content, but they should still be in there, when it makes sense to use them. Google really cares that blogs sound like they were written by a human; ideally a human who isn’t attempting to simply sell a product. Blogs are an easy way to set your brand apart as an authority on a subject, rather than a means to sell a product. Write one spammy blog stuffed with linked keywords that reads like the script of an infomercial, and your credibility goes down the toilet. Instead, try to include your target keyword in the context of valuable information, proving that you know what you’re talking about and have only one motive: to increase your readers’ knowledge on the topic. Now, about those variations of your target keyword, use them within the headers of each paragraph. For example, if you’ve decided on the title of “The 2 Important Questions You Must Ask Before Your Colon Exam”, make your first header something like “Nobody Looks Forward To Their Colonoscopy”. That way you’re reinforcing the article’s topic without over-using your target keyword in the first few lines of your blog. As you write your blog, try thinking of your target keyword as a favorite color, and all related variations as different shades of that color. For some, it even helps to highlight the words in said color(s) as you write it. This helps you avoid keyword over-saturation and allows you to easily keep track of where your keywords are used. Here is a sample paragraph which incorporates the highlighting technique. Just don’t forget to remove the highlights before you publish your blog! We’ve all seen them, the blogs that aren’t really blogs, but instead full page advertisements offering biased information with the goal of selling a product. Throughout this “blog” much of the text is hyperlinked to a landing page created to sell the product, or to the site of the “author”. Catchy phrases like “miracle cure” or “easy solution” are clickable and take you far from the interesting blog you had hoped to read, and closer to where the seller wants you to be; on the checkout page of their site! While this practice may seem like a surefire way to get visitors on your site, it rarely yields sales and more often than not, brands your company as just another spammy site hoping to make a few bucks. DON’T BE THAT BRAND! If you want people to spend their hard earned money on your product, or take their precious time to visit your site, give them something in exchange, namely valuable information in the form of an engaging blog that isn’t pushy, spammy, over-linked, or salesy at all. Truth be told, links are an important part of an SEO-friendly blog, but only in strict moderation, and only to serve the purpose of better educating the reader. Don’t be tricky about where you put your links. Today’s reader isn’t dumb enough to click on that linked text you’ve labeled “miracle cure”. In fact, this will probably deter them from ever visiting your site again. Instead, link back to your site in a way that is obvious. 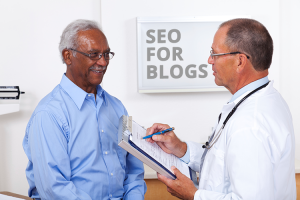 Sticking with the example of colon exams, inform readers that there is “much more helpful information which can be found in the resources section” of your site. Hyperlink the word resources, and enjoy the peace of mind that comes with knowing that those who click on that link know exactly where they are going and why they are going there. If you ARE mentioning a product in your blog, make it clear that they can easily get the product by visiting your store, filling out the form. Don’t mislead them, don’t trick them, and you’ll have a new potential customer instead of an angry reader. When all is said and done, today’s SEO is all about finding the right balance of tact and etiquette. For lack of a better analogy, if page one of Google is the exclusive club you want to get into, and you are waiting in a long line, don’t be the jerk who pushes others out of the way, spits in the bouncer’s face, or lies about being on the guest list. Instead, be the well dressed, friendly and approachable one who catches the attention of the doorman and gets waved in. Keeping this analogy in mind, the final thing to consider is the “outfit” you show up in, or in the case of SEO, your meta title and description. Meta, if you’re not familiar, is the keyword-focused title and description that form a Google snippet. It’s really just a fancy way of accurately describing your content so Google knows where to put it. Just like an outfit, it gives a preview of who you are, and if put together correctly can get you the right kind of attention. Both meta title and description need to contain your target keyword, both must adhere to Google’s character count guidelines, and must provide a sneak peek into the content of your blog without duplicating any of its actual phrasing. If this is your first time writing meta, take a moment to look over this helpful resource which will help you feel confident that you’ve done it right. Now that you have all the tools to write that SEO-friendly blog that will bring exposure to your brand, make you look like an authority on the topic, and build your repertoire of written work; the only thing left to do is start writing. Don’t worry if your topic seems bland! For every seemingly boring topic there’s a niche of interested readers who will eat up your words. SEO is simply the vessel that transports your writing to those who will find it valuable. Blogging can be time consuming, it can be difficult, it can be frustrating, but remember: it’s easier and much more enjoyable than a colonoscopy.